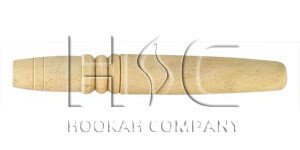 This wooden tip is the piece that fits your hose to the hookah shaft. They are standard five inch hose pieces that fit most leather Egyptian hoses. Most hookahs require a head or hose gasket to accompany these pieces so that there is an air tight seal where it connects to the hose. Wooden End Hose Piece has a average rating of 0 stars out of 5 stars based on 0 reviews.